Lets face it, beauty is a luxury that not every body can afford. Sure there are budget brands and premium brands but often after paying off living expenses, not many of us have got much left over to indulge ourselves in beauty products on a regular basis as it isn't considered an essential item in most people lives. Sure you won't die without it, but if skincare products helps to keep your skin looking youthful longer and makeup makes you feel prettier and more confident in life, then I say it is a pretty essential aid in your lives. Many brands are recognising that consumers are hurt by increased costs of living and with most of the world still griped by the GFC and living on tight budgets, it was time to review the pricing policies. What gave this movement momentum is the growing price disparities in the local market vs international markets in a period of our appreciating currency exchange that makes online shopping more appealing. The brands must have decided to take action to stem the loss of local sales and to re-align Australian prices with international markets. It started earlier this year with Lancôme announcing permanent price reductions in prices for their popular skincare and beauty lines, like the Genifique serum (now A$115 for 30ml) and their Teint Idole Ultra Foundation (now A$68). 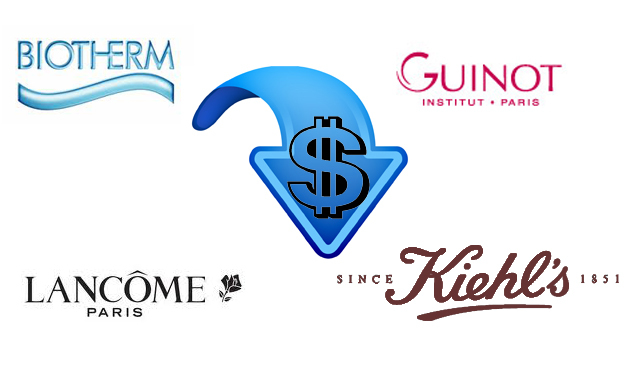 Then French skincare line Guinot reduced their prices across all product lines by up to 8.9% (every bit counts as it's more money in our pocket). Last week Biotherm have announced lower prices across all their product lines (some as much as 46%) and now US skincare brand Kiehls have joined the giving back bandwagon and have slashed prices of their products by as much as 40%. As a beauty addict, this is welcoming news and it's great to see these top beauty brands respond to the demands of consumers for more parity in pricing policies. I hope to see more brands get on board this movement and I think we won't have to wait too long before being pleasantly surprised with more upcoming price reductions across more brands on all our favourite products. Hopefully this will mean that more people can now afford to look and feel as good as they do inside. What would you rush out to by next if it was reduced by 40%? - for me, it would be a Estee Lauder's Pure Lip colours as I'm currently obsessed with lipsticks. YSL and a few other brands also lowered their price prior to Lancome's lead.